August 23, 2018 – Calgary, AB. Highland Crossing, a multi-family development in Invermere by Lake Windermere is now complete, with more than half the units sold to date. The units are priced from the mid-$500,000s to low $600,000s and all have three-bedroom configurations, with condo fees of about $300 per month. Highland Crossing townhomes enjoy high-end features such as gourmet kitchens with quartz counter tops and stainless steel appliances, high ceilings, large outside decks for outdoor living and entertaining, wood plank flooring, gas fireplaces, radiant heating in en suites, and air conditioning. The properties are designed to be lock-and-leave requiring minimal maintenance and peace of mind for those using the property as a second home. Many buyers have also been attracted to the multi-generational design of Highland Crossing and the aging-in-place features included with each unit, such as bathrooms built to support accessibility features, and elevator options. 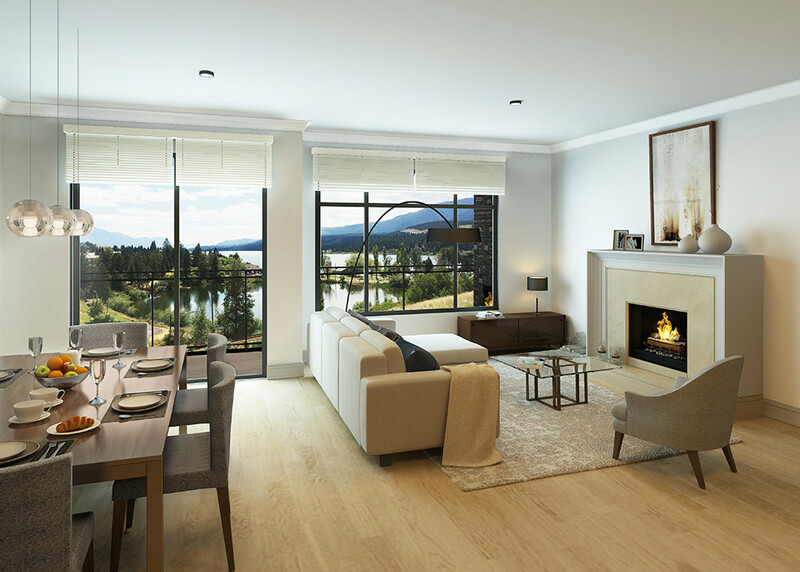 The development seeks to maximize its location overlooking the shores of Lake Windermere through picture windows and deck railings, which offer spectacular views of both the lake and the mountains. As an added incentive for new buyers, a $15,000 furniture credit is offered, with Invermere-based The Natural Home, a furniture store which specializes in natural woods, leathers, and artisan furnishings. For those purchasing a Highland Crossing property, this is a great feature to help outfit their new home and support local Invermere business. The Natural Home will also include a complimentary interior design consultation. Highland Crossing is located in the town of Invermere in BC’s Columbia Valley, offering many amenities and services to residents and tourists. The region boasts championship golf courses, world-class skiing, tennis, skating, watersports, fishing, hiking, and mountain biking. Located in Invermere, B.C., Highland Crossing (www.highlandcrossing.ca) is a residential multi-generational townhome development enhanced by the local Invermere neighbourhood and community through extraordinary living opportunities. Developed by Urban West Projects Inc., the 20,000 sq. ft. site features seven townhomes. Situated on a picturesque hilltop overlooking Lake Windermere, residents enjoy panoramic views and three levels of integrated indoor/outdoor living.